Today Amanda talks about more socks (surprised, I know) and has lots of Wool Piggery to share with you all today! She went to Stitches Midwest and had a good time. If you’re looking to play along in Sock it to Summer, you still have until 31 August to submit your finished pairs for prizes. ♥ Sock it to Summer is nearing the end! If you have more socks to submit in the group, please do so by 31 August. I will be closing the thread down when I wake up on 01 September. ♥ August Personal Sock Club – my hand-dyed yarn from a class, US size 1 needles (Sock Rockets to be exact), using the same stitch pattern as Hermione’s Everyday socks. I referenced “Greetings From the Beach” in this segment when describing the feel of the colorway. ♥ Still plunking away at my January club braid from MoonRover. ♥ Test drove my aaronmakesstuff spindle with some Gourmet Stash punis. It is slick! 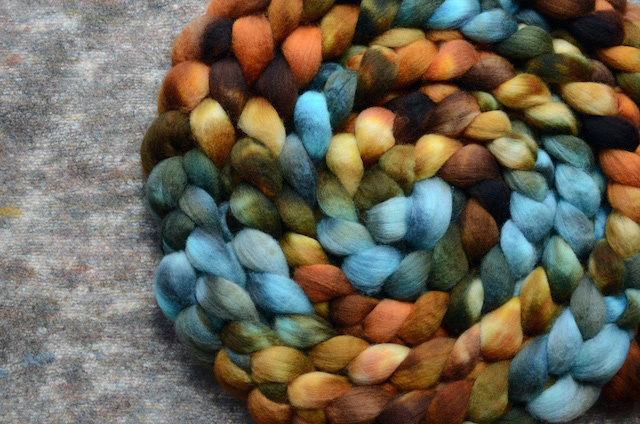 ♥ Hello Yarn July 2014 Club colorway has arrived! This month is BFL top in the “Head Banger” colorway. ♥ CreatedbyElsieB Falkland top in the “Plumeria” colorway.